Sugar…ahh honey, honey…you are my candy girlllll…..
On the list of things I like, this little PR program from a fav, Dylan’s Candy Bar, hits almost all my sweet spots. Fashion? Check. Candy? Check. Lots of Colors? Check. Sketches? Check. Ruffles? Check. Cute Stuff? Check. 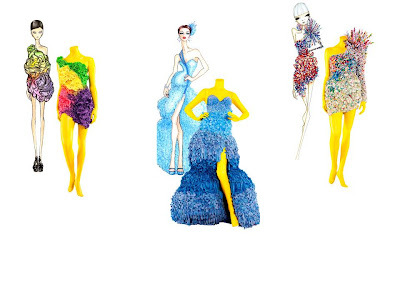 As part of their feature during the upcoming Fashion’s Night Out, Dylan’s partnered with six students from the Savannah College of Art and Design to create candy-inspired dresses. The winner will be featured at Macy’s! If only these delectable designs were edible!